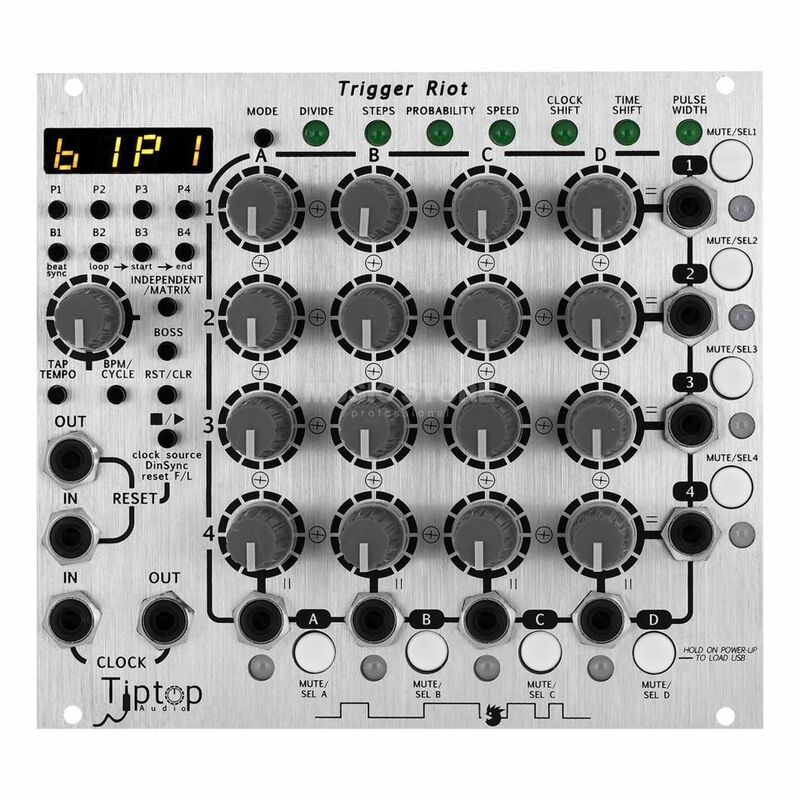 The Tiptop Audio Trigger Riot sequencer is an innovative sequencer that is used to time modular synths with a unique method that has never been seen before. It can be used to time modulation sources like the Z4000 envelope generator, Z8000 CV sequencer and many others. It can also be used to trigger Tiptop’s complete synth voices and drum modules in tandem, creating the world’s first fully modular drum machine in the heart of the Tiptop system, a modular groove composer of a new age. Imagine if you put a clock divider, clock multiplier, step injector, time shifter, clock shifter, pulse-width modulator and an arithmetic probability processor under the control of a single knob. Now what would happen if you fit sixteen of these knobs into a single module and have them interact? You will have a riot, a Trigger Riot! With so much going on in eight channels, simply tweaking a few knobs builds new sequences, causes patterns to evolve and makes streams of triggers and gates come pouring out of the outputs! The Trigger Riot is a highly accurate clock source: it has 8 outputs, each can have up to 4 clock divisions and each of these divisions can be assigned a probability of triggering, clock shifting, time shifting, fractional clock multiplication, and pulse width. Additionally, each output has 4 steps that do not repeat like a division.